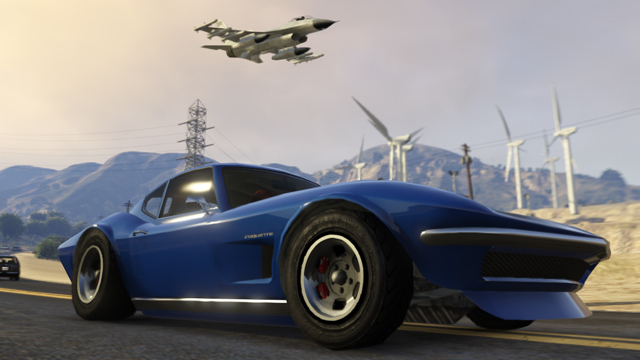 GTA Online's Flight School Update has been released on Xbox 360 and PS3. The new content can be downloaded through automatic update 1.16 on both consoles. The Flight School Update adds 10 new solo flight challenges to GTA Online. 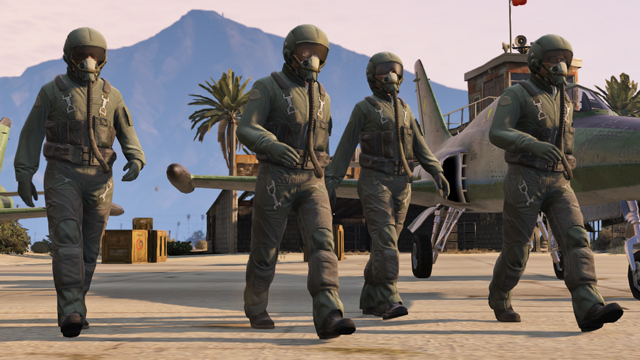 To ensure that you look like a pilot while you're in the air, Rockstar has added several new aviation-themed clothing items like flight suits and new custom parachutes. They've even included a reserve parachute to give you more possibilities for your skydiving. The update adds two new helicopters and jets for both single-player and multiplayer modes. The new Invetero Coquette Classic sports car, meanwhile, gives you a speedy new way to get to the airport. While solo missions are a big part of the Flight School Update, it also includes several new multiplayer missions. The 22 new Jobs includes Races, Parachute Jumps, and Capture Jobs. Rockstar also brought back four previously deactivated missions: Stocks and Scares, Chemical Extraction, Rich Men in Richman and Hack and Dash. "Stay tuned for more details on continuing updates to GTA Online, and look out for specifics later this week on the upcoming Event Weekend to commemorate the launch of the San Andreas Flight School Update," Rockstar says on their Newswire. Patch 1.16 makes a wide range of gameplay changes, too. More difficult contact missions now reward more GTA$ and RP. The rewards will also scale based on how much time they take and how many other players you bring along. Furthermore, mission replays no longer have reduced rewards. I hope this means players will have to do less grinding or exploiting to earn money but we'll see. The full patch notes for 1.16 are below, courtesy of the Rockstar Support site. Cash rewards are no longer reduced by 50% on replay of a Contact Mission. Players will now receive the full reward for completing a Mission every time. Cash and RP for Contact Missions have been rebalanced. This is to ensure that all Contact Missions pay out a fair reward in relation to the mission difficulty and amount of time taken. The potential cash payouts have increased significantly overall, although some specific missions have been reduced as a result of the rebalance. The San Andreas Flight School is now open for business in GTA Online. The Flight School can be accessed via a Job corona, from rank 6 onwards, at Los Santos International Airport indicated by a small plane icon on the map. Ten flying lessons have been added as part of the Flight School which will help to improve players’ flying skills. Players are now able to purchase and equip a reserve Parachute at Ammu-Nation. They can choose different canopy designs for their primary and reserve parachutes. 25 new ‘flags of the world’ themed parachute bags have been added to Ammu-Nation in GTA Online only. A new Flight Suit outfit has been added for Male and Female characters. This is available in all clothes stores in the outfits menu. A new Flight Cap accessory has been added for Male and Female characters. This is available in all clothes stores in the hats menu. Players who downgrade to smaller garages will now be able to request vehicles stored in previous garages from the Mechanic. Players in Tanks will now show as such with a specific Tank icon on the Minimap. Substantial changes made to On Call functionality to enable players to enter their choice of Job as quickly as possible. Fixed an issue where Crew Leaders could occasionally be unable to put a Crew Emblem on Jackets or Hoodies. Fixed an issue in the Creator where placed props would not appear correctly. The color of the player’s Parachute Bag can now be chosen through a new option in the Interaction menu. They can also toggle the visibility of the parachute bag if they have a parachute equipped. A player’s Mental State now also decreases over time whilst using the Spectate feature. ‘NEW’ now appears on invites, alongside the Job type, for all Rockstar Created or Verified Jobs that have not yet been played by the recipient. This only appears on feed invite notifications, not on the phone. Short- term RP and Cash bonuses will now show in Job coronas as well as on the Next Job Voting Screen. News screens shown during transitions will now alert players if some Jobs have RP or Cash bonuses for playing them. Both the Driver and Passenger are now able to see direction arrows in Rally Races. If players choose to use a custom vehicle in a Race, that vehicle will now be saved and used as the default on the vehicle selection screen of the next Race. Players are now able to talk to one another in spectator mode once they have finished a Race. Players are now able to change the spectator camera mode and angle when they begin to spectate after completing a Job. A small change has been made to time formatting on Leaderboards so that they now read as “00:00.000”. The cap for the amount of Cash stolen by Muggers has been adjusted to allow for differences in level. Players can now set the duration for One on One Deathmatches in the Interaction Menu. A new on/off option has been added to the Interaction Menu to allow players to choose whether to wear a Helmet when using Motorbikes. Co-op teams now appear grouped on Mission Leaderboards. When using a Plane, you can now toggle the minimap by using D-pad down. Fixed a wide range of exploits. Fixed an issue where players could lose control of their characters when accepting an invite during main load screen via the XMB menu. Fixed an issue where it was possible for Personal Vehicles to spawn on top of one another. Fixed an issue where players could be removed from the ‘On Call’ queue if they entered the GTA Online Pause menu. Fixed an issue where it was possible for players to not be informed that their aim settings had changed after using Find New Session. Fixed an issue where it was possible to destroy a vehicle containing 4 players, and only kill the driver. Fixed an issue where it was possible for players to become stuck on Skycam after completing the tutorial Race. Fixed an issue where it was possible to spawn within Fort Zancudo after completing a Mission. Fixed an issue where player models would clip one another on the Leviathan if players attempted to sit in the same cart. Fixed an issue where it was possible for players to clip through the Leviathan carts when getting out after the ride finished. Lester’s abilities ‘Remove Wanted Level’, ‘Cop Turn Blind Eye’, and ‘Off Radar’ now apply to all passengers in a vehicle as well as the player who initially triggered it. Fixed an issue where players could be charged multiple times for riding the Ferris Wheel. Fixed an issue to ensure that players who set Mercenaries on opposing team players during Deathmatches correctly receive a point if the Mercenaries kill a rival player. Fixed an issue where it was possible for players to be pulled back onto the Ferris Wheel involuntarily if they were standing too close after getting off. Fixed an issue in Vehicle Deathmatches where players could be targeted but would not be properly blipped on the Minimap. Fixed an issue where NPCs and their vehicles would appear in the way of properties introduced with the Independence update. Fixed an issue where players could hang for a short period of time when entering property. Fixed an issue where players who lost a Race would occasionally see themselves performing a celebration animation. Fixed an issue where various vending machines were not working correctly. Fixed an issue where the Leaderboard would not appear when a player was spectating a Race. Fixed an issue where players in Team Deathmatches were able to hear the other team talk. This has now been normalized so that only players on the same team can talk. Fixed an issue where some parachute smokes would not transfer between sessions correctly. Fixed an issue where players could occasionally have hard-top versions of vehicles delivered to them when they ordered the convertible version. Fixed various issues where clipping could occur with clothing when players took selfies. Fixed an issue where it was possible for a spectator to become stuck in property when ‘all exit’ to garage is triggered. Fixed an issue where players in GTA Online were unable to call other players in Single Player, as well as calls between players in Single Player. Fixed a small issue where the end of Race timer was overlapping player help buttons when a player was spectating. Fixed an issue that could leave players stuck when switching between players in spectator mode. Fixed an issue where players were unable to launch Contact Missions which they had previously bookmarked. Fixed an issue where it was possible to become stuck in a spawning loop when dying after bailing from a Helicopter over the Ocean. Fixed an issue where players were unable to invite Friends’ Crews in Head to Head matches. Fixed an issue with transitioning into an event Playlist when choosing to enter the Playlist from the boot screen. Fixed an issue where players who destroyed their own Pegasus vehicles would be given an increased mental state. Fixed an issue in the Creator where weapons could be incorrectly named. Fixed an issue in the Creator where a player testing a Capture Mission would be unarmed regardless of whether or not they have or are given weapons. Fixed an issue in the Creator where switching the vehicle class would also change the radio station. Fixed a text issue specific to Chinese and Japanese versions of the game in the Creator where an unsupported character could be seen when attempting to Copy / Delete a Job. Fixed an issue where it was possible for a player to hang when changing the Default Class in the Air Race Creator. Fixed an issue where Weather conditions would not synchronize properly between a spectating player and the player being spectated. Fixed an issue where Bookmarked Air Races would occasionally not appear in some Bookmark lists, but would appear in others. Fixed an issue where it was possible for players to become stuck when launching Contact Missions. Fixed an issue where it was possible to hang when exiting the Deathmatch Creator tutorial. Fixed an issue where it was occasionally possible for players to not receive Auto-invites when the friend sending them was in same session. Fixed an issue where spectating players would sometimes appear in free mode at the North-East corner of the map far away from everyone else, after a job. Fixed an issue with Armored Trucks constantly spawning. Fixed an issue where an enemy in survival would occasionally run away from the shootout. Fixed an issue where it was possible for the incorrect horn to play when testing horns in the Mod Shop. Fixed an issue where it was possible for a newly purchased Personal Vehicle to become permanently locked if the player accepted a Job invite in the time between purchasing it and receiving it. Fixed an issue where players would not be charged for Insurance.